Posted on March 15, 2016 | Comments Off on It’s Fenugreek to Me! Although not a household name in the U.S., fenugreek is well known and widely used in India and China, as a food, a spice, and as a Traditional Chinese and Ayurvedic medicine. Actually, fenugreek has a long history of medicinal uses dating back to the times of Tutankhamun and the ancient Egyptians. Its uses are many and varied, ranging from a reduction in LDL cholesterol levels to digestive and blood sugar support. Known as “methi” in many parts of the world, all parts of the plant are useful and contain a wide variety of beneficial nutrients. These include natural soluble dietary fiber, phytonutrients, essential fatty acids, minerals such as iron, magnesium, manganese, copper and phosphorus, plus vitamins A, C, B1, B2, B6, and folate. Cholesterol support – A major portion of the fiber content of fenugreek seeds is non-starch polysaccharides (NSPs), which help to positively influence triglyceride and serum cholesterol levels, lowering LDL and increasing HDL. Improved digestion – Commonly eaten after meals, fenugreek is often used to counter acid reflux and relieve indigestion, heartburn and uncomfortable feelings of fullness. The natural fibers support weight reduction by enhancing digestion and regularity and suppressing appetite. Blood sugar support – Fiber helps to slow digestion and the absorption of carbohydrates, lowering glucose absorption and helping to regulate blood glucose levels. Additionally, fenugreek contains the amino acid 4-hydroxyisoleucine, which works to normalize blood sugar and improve insulin production. Several clinical trials showed that by lowering blood glucose levels and improving glucose tolerance, fenugreek can improve most metabolic symptoms associated with type 1 and type 2 diabetes. Antiseptic and antiviral properties– Applied topically as a paste, fenugreek can be used as a first aid remedy for skin injuries, wounds, blemishes or rashes. Because of its natural antiviral compounds, fenugreek is commonly used as an herbal remedy for colds and sore throats. Along with its anti-inflammatory properties, fenugreek has been shown to help reduce the inflammation associated with symptoms of bronchitis and asthma. Pain relieving properties – Fenugreek is often used to relieve abdominal cramping associated with menstruation. Applied topically, fenugreek is useful for injuries, muscle pain, eczema and swollen lymph nodes. Menopausal support – The estrogenic isoflavones found in fenugreek also help to minimize mood swings and hot flashes associated with menopause. Inflammation – Fenugreek helps to calm the body’s inflammation response, aiding pain relief and digestive conditions. Chronic inflammation is associated with joint pain, heart disease and cognitive disease. In Chinese medicine, inflammation is known as “heat,” and is believed to block the flow of “qi” — the vital energy and life force–resulting in pain. 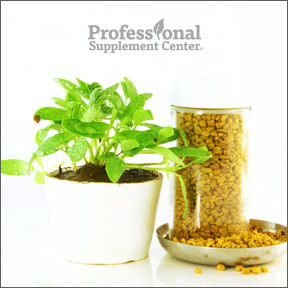 Antioxidative effects – Fenugreek helps to prevent and reduce damage due to oxidative processes. Although we depend on oxidative processes for life, too much oxidation causes premature aging. This often results in inflammation, the root cause of many chronic age-related diseases such as cancer and diabetes. Hair and scalp health support – Applied as a topical paste, fenugreek promotes shiny, healthy hair and effectively reduces dry scalp and dandruff. Male libido – A double-blind study found that fenugreek extract safely and effectively increased sexual arousal, and enhanced libido in young to middle aged men without erectile dysfunction. Promilin™ Fenugreek Extract by Source Naturals – This formula provides a standardized, patent pending fenugreek seed extract that aids in supporting healthy blood glucose and insulin levels when used as part of a healthy diet. One tablet provides 600 mg of dietary fiber in a vegetarian formula. Fenugreek by Now Foods – One serving provides 1000 mg of fenugreek seed powder traditionally used since ancient times for a variety of medicinal uses. Gluten, soy and dairy free, Non-GMO formulation. Fenugreek Plus® by Metagenics – This product provides a highly concentrated, unique, odorless fenugreek extract in a traditional herbal formula in support of healthy glucose metabolism. One serving provides 800 mg of dietary fiber. Gluten and dairy free, Non-GMO formulation. Fenugreek Full Spectrum™ by Planetary Herbals – This formula is designed to help support healthy sugar metabolism and healthy glucose levels with traditional fenugreek seed powder rich in galactomannan fibers. This entry was posted in Home and tagged Fenugreek, Fenugreek by Now Foods, Fenugreek Full Spectrum™ by Planetary Herbals, Fenugreek Plus® by Metagenics, Professional Supplement Center, Promilin™ Fenugreek Extract by Source Naturals, Vitamins and supplements, www.professionalsupplementcenter.com. Bookmark the permalink.